In 2008, United entered their third and final year with kit supplier Hummel. In a break from tradition, Hummel moved their chevrons from the sleeves of the shirt to the sides in curved black under arm panels. The chevrons were tangerine and black, similar to the previous two seasons. Again the club badge was located on the left side with the Hummel logo central below the black trimmed collar. In a deviation from the previous two years, the Hummel logo was embroidered in white rather than black. United unveiled their new kit sponsor as Carbrini Sportswear, which was owned by the UK’s leading sports fashion retailer, JD Sports. As part of the deal, JD Sports became the club’s shorts sponsor. 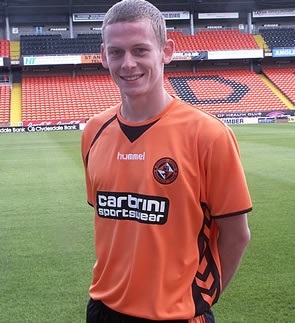 In hailing the change, Dundee United Chief Executive Stephen Thompson said, "We are delighted to announce this new sponsorship deal and to be associated with such an established name in sports fashion retail." The ‘Carbrini Sportswear’ text was white on a rectangular black panel located in the centre of the shirt. The curved black design that framed the under arm chevrons, ran around the circumference at the base of the shirt. With the shirt un-tucked, the black base design gave the impression that it was shorter in length than it actually was. This was just one of the reasons it was the least aesthetically pleasing home shirts in recent times. The other key reason was the tangerine colouring. Gone was the vivid and bright tangerine of the previous season and instead, replaced by a light orange colour that was un-popular with the fans. Again, the Clydesdale Bank sponsorship was located on both sleeves. On the back of the top was the Fat Sam’s logo and this year the player names and numbers were white with black trim. The numbering also contained the SPL logo. Wilkie, Flood, Feeney and Sandaza were just some of the stars to wear this kit. 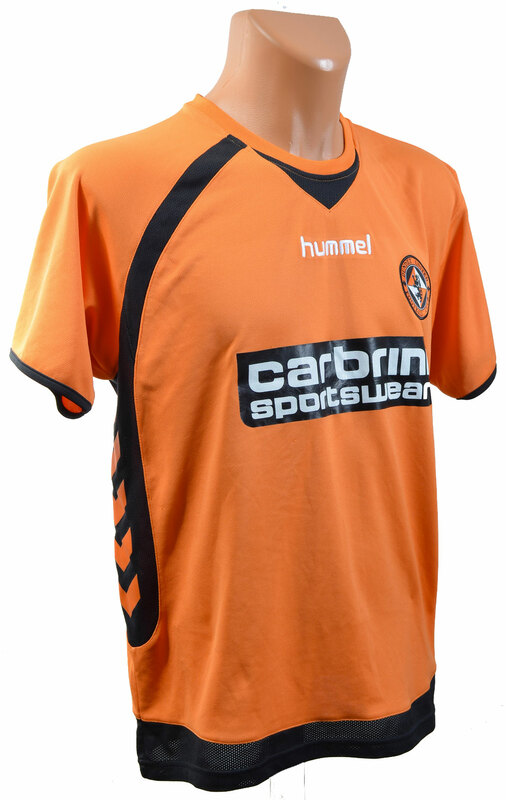 United sported the tangerine home shirt in a memorable C.I.S. Cup Semi Final on the 28th of January 2009. After the game ended 0-0, United missed out on the opportunity to get to their second final in successive years, losing 11-10 in a breathtaking sudden-death penalty shoot out. Remarkably, Willo Flood missed after having to take a 2nd penalty. Levein said afterwards, ‘’I wish I could have won for the fans more than anything else. As a team we will improve from this and hopefully be able to give the supporters something tangible.’’ United would go on to win the Scottish Cup the following season. The team first wore the shirt competitively in the season opener at New Douglas Park in a televised match against Hamilton. Although United opened the scoring that day, they lost 3-1. The final game in the kit was a 3-0 defeat to Rangers at Tannadice on the 24th May 2009, a match that was meant to kick off the Club's Centenary celebrations, but instead saw the Glasgow club celebrating winning the SPL title.